Corfe Castle is older, bigger and more sinister than Kenilworth Castle. Its gigantic tower rose over the entire area over the entire peninsula Purbeck. Some of its fortifications dating back to the Norman invasion. It was often used as a prison, in particular one hundred and twenty years ago, when it was used to exterminate there twenty-two starving French Knights. Corfe Castle is as if it was intended for crimes. Ominous superstition associated with it, stemming from the murder of a fifteen year old child, king Edward, called the Martyr, the first of Edward II Saxon dynasty before the tenth century. "This is the short description that the writer Maurice Dryuon offers this intriguing English castle in the novel French Wolf". 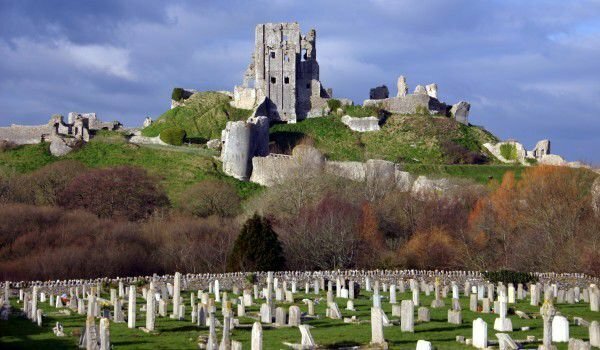 Today the ruins of Corfe Castle keep hidden a nearly 1000-year history of this fort. Located in the English county of Dorset, the fortress overlooks a small village bearing the same name. Corfe, in the form that it has survived until today was built during the 11th century historical sources indicate, however, an earlier Norman building was in place. It is assumed that in it died Edward the Martyr in 987. The building’s stone hall and the main internal walls were raised in the 11th century, and other towers, halls and other leading walls were built during the reign of Henry I, John and Henry III. Until the early 13 th century castle Corfe served as a treasure that keeps the royal jewels, and then a prison. Today, the Corfe Castle and the area around it are a place for walks during the weekend of many Englishmen. The route here is small and in most cases, a tour takes less than 15 minutes. Especially for tourists are built parking (outside the village), gift shop, and some good places to eat in the village. Tours of Corfe Castle itself are allowed all year except 25 and 26 December.